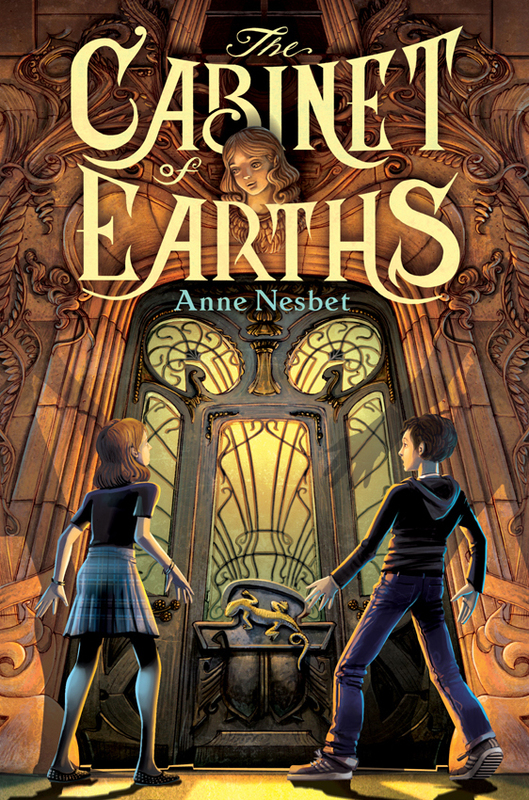 The Cabinet of Earths, debut novel from Anne Nesbet stands out above recent fantasy novels I have read for the creation of main character, twelve year old Maya. For me, Maya can take a place at the table with strong girl characters in fantasy novels alongside Hazel, hero of Anne Ursu's beautiful Breadcrumbs. At the head of this table is Lyra Belacqua, the fearless, complex, heartbreaking hero of Philip Pullman's trilogy known collectively as His Dark Materials. It is rare in middle grade fantasy to find stories that are so character driven, espeically those with a girl at the center, and I am grateful for each one. The Cabinet of Earths begins, "It was his own grandmother who fed Henri-Pierre to the Cabinet of Earths, long ago when he was only four" and sets the stage for the magical framework of the book. In the second chapter of the book we meet thirteen year old Californian Maya Davidson as her family is moving into their new apartment in Paris and she is startled by the realization that the shadowy figure she glimpses out of the corner of her eye is actually a reflection of herself, "her own worried face staring back at her, caught like a prisoner, in the glass of the wall-sized mirror. Like a strange, sad creature in a cage at the zoo." Despite the beautiful new city (which Nesbet evokes so well that I was craving macarons as I read) and year of adventure that her family is embarking upon, her chemist father having been invited to Paris, all expenses paid, by the Society of Philosophical Chemistry, Maya does actually have much to worry about. Her mother is recovering from cancer and, while well enough to travel, is still frail. Maya is just old enough to realize that her parents are not always completely honest with her when discussing her mother's health and she is also old enough to personally take on the responsibility of shepherding her exuberant, enchanting five year old brother, James, two huge things for a young girl to shoulder, let alone evil magical forces. A paragraph describing Maya's anxious nature as well as exemplifying Nesbet's wonderful, descriptive writing starts Chapter 8, titled, "Worrying,"
Every single person on the planet probably has some bad habit they'd rather the rest of us didn't know about. People leave their underwear on the floor or wash their hands too much or write love letters to television stars of always put off doing their math until the last minute. Maya, for instance, was a worrier. She knew she was but it was still aggravating when her mother pointed it out ("You worry too much, honey-bun! It'll all be okay, really it will" - though the universe didn't have a very good track record on these things, as far as Maya could tell.) As long as she could remember, Maya had always worried with her hands as well as her mind: She would pick loose threads on her clothes until the edges unraveled, trouble her fingernails down to the quick, roll the wax that slipped down candlesticks into smooth and milky pills. And scabs! They didn't stand a chance. (Why was her mother still so tired?) Rummaging through the big supply closet in the study she found some tiny plastic bottle caps that could serve as glasses. (Her father saw it, too; that look on his face at breakfast!) And glue that when it shaped into sticky little white peas could be dipped in cardamom or cinnamon and made into blobs of miniature sand. (If her mother was sick again, would they tell her?) Rectangles of plastic became the shelves; she built the cabinet's frame from tiny dowels, glue, and clay. (The would try to hide it from her, probably, as long as they could.) It was the oddly familiar curve of the plastic casing that had done it, the shell from which she had extracted James's silly windup clown. That had probably given her the idea. (She would watch them like a hawk; she would not let them fool her into thinking all was fine.) More glue to fit the shelves with their rows of tiny glasses into the frame with its rounded front. And then there was just the question of the salamander. I realize that I have just quoted two very long passages, but I really wanted to give you a feel for just how out of the ordinary and special both Maya and The Cabinet of Earths is. It turns out that Maya's mother has family in France and she has a Cousin Louise who offers to tutor Maya in French. Louise is famous for having survived the collapse of an Italian stone church that killed the rest of her family. Louise herself is an enigma to Maya. Upon first meeting her, she barley realizes that Louise is there and thinks to herself, "How could an ordinary person be so very hard to see?" Louise has a voice that sounds "like nothing at all," reaching hands that are blurry, eyes that are ordinary brown and dull like her hair. Louise shadows Maya, tutoring her at a nearby cafe where Maya must order their drinks because the waiters never see Louise, and following her to the strange building with a large salamander on the intricately wrought iron door across the street where the handsome young man with the purple eyes lives. Oddities begin to pile up, from a hidden packet of pictures of strangely glowing children with peculiar numerical markings on the back, to a fountain ringed with stone cherubs and dedicated to "Aux enfants perdu," to radiantly youthful adults constantly emerging from the Salamander building and speaking of "anbar." As memories begin to emerge in Louise's opaque mind, she and Maya set out to find her uncle Henri who took her in after she lost her family when she was three. Henri de Fourcroy turns out to be an elderly recluse who is building miniature sets for the grand opera he hopes to stage called The Chemical Brothers. He has much to tell Maya about the history of the Lavirottes, from which both he, Louise and Maya are descended, beginning and seemingly ending with brothers betraying brothers, claiming that it was the greedy Fourcroy line of the family that was responsible for the death of the great scientist Lavoisier. But, it is the mysterious, magnetic Cabinet of Earths in Fourcroy's kitchen that proves unforgettable and pivotal for Maya. So drawn to this beautifully wrought bronze cabinet filled with bottles and vases, each of which houses bottles of earth in various shades of "reds, russets, browns," Maya finds she cannot speak of it to anyone and, full of worrying energy, crafts a small version of the cabinet worthy of one of old Fourcroy's creations. Nesbet weaves these unconventional and seemingly eccentric aspects into a strong plot that has a dramatic climax during which Maya finds she must make some difficult decisions regarding the exquisite cabinet and a possible cure for her mother as she tries to rescue James from the corrupt head of the Society of Philosophical Chemistry who has found a way of imbuing eternal youth that is almost as disturbing as the portions of The Golden Compass where scientists were experimenting on the effects of removing dæmons from the child companions. Happily, Nesbet is at work on her next book, a sequel, due out in 2013 titled, A Box of Gargoyles! Sometimes it’s just when you think everything’s finally all right with the world that the gargoyles come looking for you . . . . .
Great review, I couldn't get into this book, but I am glad you like it. To me it was just to slow going and I never finished reading it. Sorry to hear that. It is a unique book, though, so I completely understand that not everyone will be swept away by it!